UK Artist Clare Elsom brings fantastic humor and wit to her charming drawings. Her portfolio is packed with samples of her fantastic art that’s been featured on children’s books, merchandise and publications from around the world. 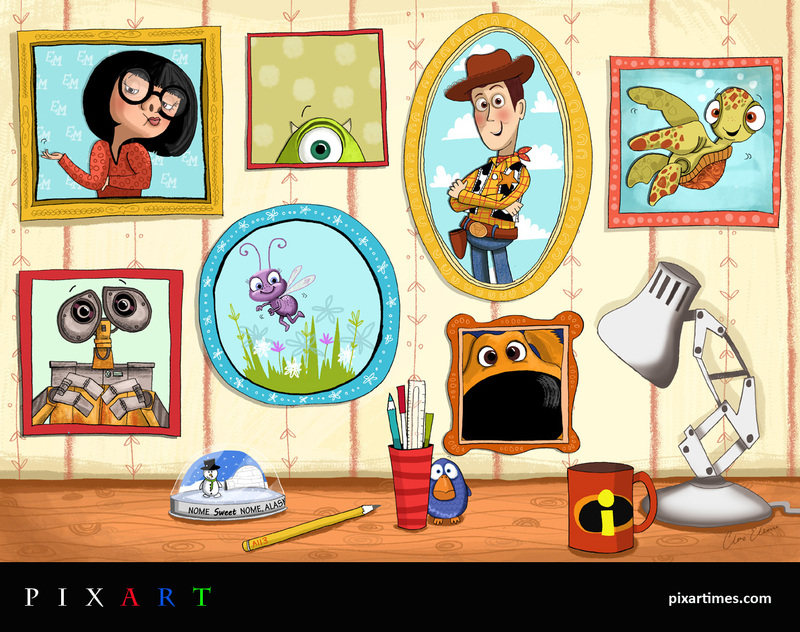 And now she lends her distinct style to the world of Pixar in this fantastic tribute. Our thanks to Clare for this wonderful wall of characters. Make sure to visit her website and blog to see all the other great images from this very busy artist! Argh, what a question. I think it has to be Toy Story. It’s such a brilliant idea for a film. Those characters!! I love that the problems and politics and relationships between the toys all feel so convincing, you know that Pixar have thought about EVERY little detail of this world. They have also managed equally brilliant sequels – the ending of Toy Story 3 broke me. Probably Wall-E. The amount of personality they packed into that little bashed-up robot is phenomenal. It was lovely to work on something so self-indulgent. I really enjoy character design, and it was a refreshing challenge to focus on someone else’s style. I spent about 30 minutes on the image most mornings in the past couple of weeks as a warm up to my day. It forced me to draw differently, to move away from my default and experiment with different techniques, colours, brushes, lighting and poses. A tiny insight into how the masters do it! Mainly people watching, animals, stories, animations and funny phrases. And lots of other incredible illustrators of course. Also pattern, wallpapers, colour, photos…. clutter, typography…. costumes, high street fashion, sweet wrappers… machinery, toys, ornate buildings… I could go on and on. 1. The Art of books. I own far too many, but the Monsters Inc, Frozen and How to Train Your Dragon (whoops, bit blasphemous on a Pixar site!) ones are my current daily inspirations. Full of incredible character designs, compositions and patterns. 2. The website design-seeds.com for colour palette binges. 3. Kyle T Websters photoshop brushes. How I worked before Gouache Less Dry came into my life, I do not know. Have a peek at some recent books I’ve illustrated: The Last Chocolate Chip Cookie by Jamie Rix, The Maisie Mae series by Poppy Harper and Sparky at Magic School by Ruby Nash.